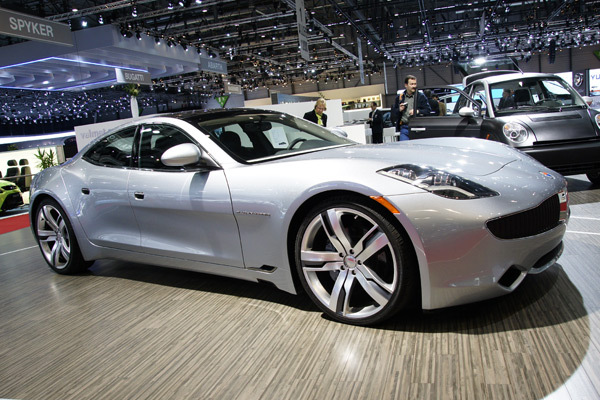 Electric car brand Fisker is planning to come to Australia, but rules out their Karma saloon. Fisker Automotive will be in Australia as soon as 2012 but not with its first vehicle, the plug-in hybrid Karma luxury saloon. Instead, founder Henrik Fisker, the former BMW, Aston Martin and Ford designer, confirmed that the more mainstream 'Project Nina' will be Australia-bound. A plug-in passenger car range priced around US$40,000, Nina variants will be built in substantial numbers at a recently-acquired GM plant in Deleware, USA. The left-hand drive only Karma is limited to 15,000 examples being produced by supplier Valmet in Finland. This total includes two other body styles, including a convertible. "The numbers and the investment mean it is just not worth it to build the Karma in right-hand drive," said Fisker, who unveiled the first production example of the BMW 7-Series limousine-sized saloon at the Paris motor show. "We can't sell enough to justify the $50 million, or whatever it costs, to do it. "Nina is a premium car and we haven't said a lot about, but it will be built in bigger numbers and right-hand drive. I think we could get to Australia by the end of 2012." The Karma is a range-extender hybrid with an 80km electric-only range before a 2.0-litre turbo-petrol engine kicks in and recharges the lithium-ion battery, providing a further 400km range. Fisker claims 300kW and 1300Nm for the Karma drivetrain and a 200km/h top speed. Fisker Automotive has taken more than 3000 deposits for the Karma, which will be priced roughly the same as a BMW 750i (just under $300,000 in Australia). First deliveries will be in Europe and the USA in March, then six months later in Asia.